Mix & Match 2 NeckUps and receive $5.00 off Order Total. The NeckUp Mini Narrow Body is a newly developed model specifically for narrow body electric guitars like Strats, Teles, Les Pauls, SGs, ES-335s and Solid Body Basses. Also works well for resonator banjos, mandolins, and ukuleles. It is 2 inches wide with two inline 1. NeckUp Mini Narrow Body has been added successfully to your wishlist. The NeckUp Mini Narrow Body is a newly developed model specifically for narrow body electric guitars like Strats, Teles, Les Pauls, SGs, ES-335s and Solid Body Basses. Also works well for resonator banjos, mandolins, and ukuleles. It is 2 inches wide with two inline 1.25" suction cups for better hold and stability. The neck angle is continuously adjustable from level to over 45 degrees. Several punched holes allow the use of rim mounted output jacks. It has a lower center of gravity that gives better balance and control. 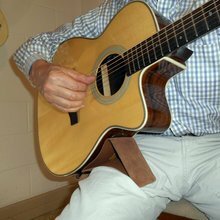 NeckUp Guitar Support allows better posture and a comfortable neck angle for playing. Buy NeckUp with confidence with our 90 day return policy.